The Sassy Sisterhood: They get by with a little help from their friends. This is the first of my "terrific books" read in 2006. It's so rich, I'm having a hard time summing it up into words that make sense. This novel is drenched in forgiveness and redemption, but without the preaching and without making me feel like an inadequate Christian for hanging onto all my own baggage. Everyone in this novel has struggles and yet also somehow finds peace with their Maker. Nothing phony or cheesy. My favorite part of this book is that everyone is so incredibly REAL. Dana is me, hang-ups and all. It's kind of weird, seeing myself in print, but it's like Mary is telling me, "I know you, cuz you're my sistah." Although I don't have Dana's ability to concoct those yummy bath and body products--Gimme some of that Vanilla Smella! There were points in the story where I wanted to give Dana a hug, and other times I wanted to smack her silly (what's up with her giving away all her bath and body products to her uber-selfish cousins? No such thing as a free lunch, toots.) but Dana's self-depreciating and yet fired-up personality drove the book like she was on a Harley Davidson and I was hanging onto the back and screaming for my life cuz I couldn't drink in enough of the fun. I think that's why I like this book so much. The characters are really rich. The story opens with already a ton of past hurts and conflicts and broken relationships. I kept reading and being surprised: "She dated HIM? And he married HER? Whoa, momma!" I love it when a book does that. I don't know how she does it, but Mary has me laughing and snorting on one page and crying on the next, which is totally unfair because I'm not a sobby person. 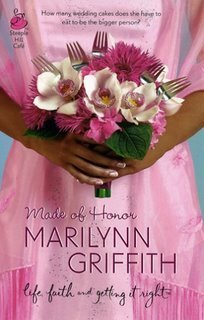 The book is a fragrant (haha) mix of chick-lit and women's fiction, and would appeal to both types of readers. Even though I'm not from the 'hood, the characters sucked me in like they were my neighbors, my church, my family. I'd really like to attend one of those "singing" church services like in the book--that sounded so cool. Bottom line--this is such a great book. Go out and buy this. Tell your church ladies to read it. Give it to your coworkers. We're all sistahs. This sounds like such an AWESOME book! Of course, Mary is awesome herself, so it's no wonder she'd write such a great-sounding book. We're having a PINK party at my house in just over a week for my daughter & her friends who are about to graduate from high school. It's gonna be SO MUCH FUN! Visit Mary's site to see how you can have a PINK party or a MADE OF HONOR party for a bride-to-be! Oh, my fingers are itching. I can't wait to pick it up at conference! I really enjoyed this book. In fact, I'm trying to start up a singles group at my church and thought that the whole Marrying your Maker idea was something we should pursue. (we'll see how that goes over once we get beyond the talking about the group idea and into the actual meeting as a group). I wanted to find Dana's store because all the soaps and lotions and candles.... Yeah, I want to find a store like that! The characters were real and engaging and funny. Can't wait to read the sequel. So what's with the forks in the flowers? And where's your TMI section gone?? I so loved this book. Mary has a great voice and I'm looking forward to reading the next book in this series. Dana seem so real to me. You definitely have to visit a singing church, I couldn't imagine attending a church with no singing. This really does sound like a great book though I've never read anything by this author. Actually, for a while during your write-up, I thought "Mary" was the main character. Since I'm in a similar situation right now about hurts, etc. though not about weddings, I think this would really be a great book to read. I must certainly keep a look out for it, see who might have it. I'll go to her site too. Thanks, Camy, for writing such a great review. Yep, I agree, in the Lord we really are all sistahs, even those who aren't Christians could easily become ones if we prayerfully give them a book like this one. Oh, yeah, I've finally got to find out what the big deal is about PINK. Is there a secret significance to it, something I'm not getting? Writers have "Pink" books, Pink Parties, etc. So, anybody care to explain to someone left faaar behind?